Morning at Lower Young Lake. 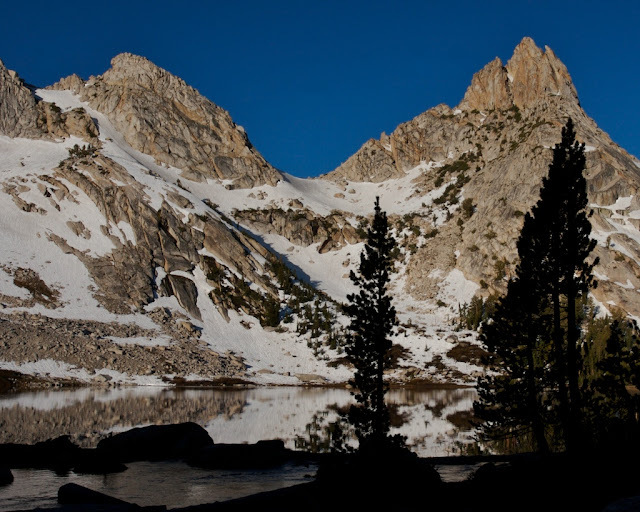 "I have a good idea for your blog" Beylah said, "how about a Backcountry Blunders section?" I paused for a moment - it was a good idea - but I had to wonder if this trip was really going that poorly. Then I looked and Beylah's poor face, and arms, covered in mosquito bites - yeah, it was going that poorly. 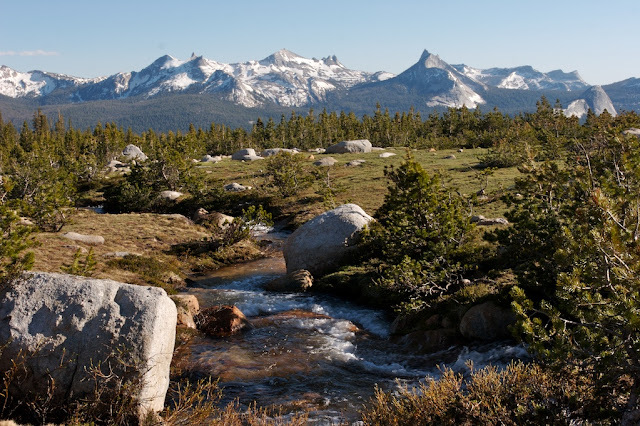 The Young Lakes lie about 5 miles northeast of Tuolumne Meadows. They can be accessed either by the slightly steep Dog Lake trail or the more gently ascending Glen Aulin trail. 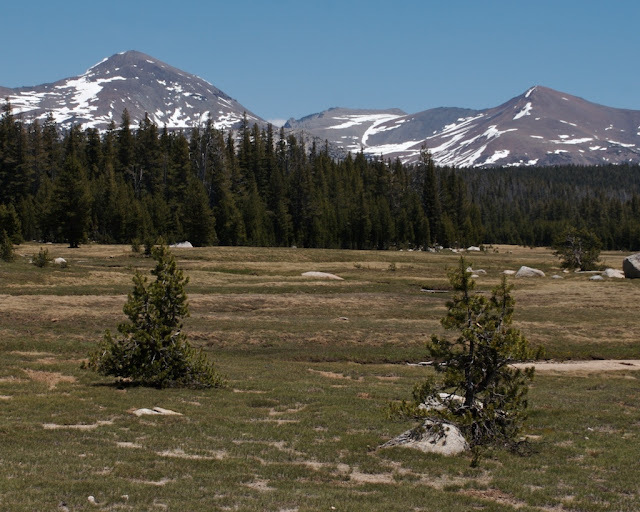 Either way you begin near the Lambert Dome at the east end of Tuolumne Meadows. We took the Dog Lake trail, starting in the afternoon around 2pm after a late start and plenty of traffic to drag out our trip along the Tioga Road.The weather was perfect, Mid-70's and plenty of sun. The streams and creeks were still roaring furiously as snow from the heavy rain season continued to melt rapidly. It may have been summer back in the Bay Area but clearly nobody had mentioned this to Yosemite, still stuck in spring with snow covering most of her high peaks. We skipped Dog Lake on the way up, electing instead to try and make the best time we could up to Young Lakes and get our camp set up before dark. We decided Dog Lake would be a nice rest stop on the way back, about a mile from the parking lot. After Dog lake the dry trail becomes pockmarked with stream crossings, small meadows, and vernal ponds, all signs of the lingering snow which had just left this area. This was also Mosquito country. 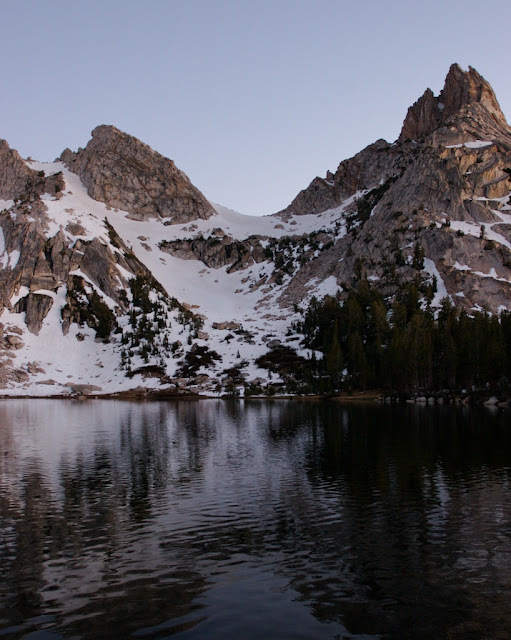 In several trips up to the Sierra's in the last two years I had not run into a single Mosquito. They made the next two miles a living hell. At first just mildly irritating they grew into swarms and swarms. We had failed to bring any bug spray and were entirely at the mercy of these evil little bugs. I collapsed my trekking poles so I could use both my hands for swatting them away, eventually I put on my waterproof jacket for armor. Beylah had a long sleeved shirt on, but it proved no match for the Mosquitos. She woke up the next morning with over 100 bites on her face, arms, neck, chest, legs, and hands. The crossing at Delaney Creek was the worst, the swarm was thick enough I would have 10-15 on me at any given time, even as I tried to swat them off frantically. had I not elected to drop my pack and run screaming through the meadow I would have noticed the glorious high peaks of the Tioga and Mono pass area looming off to the East. The creek was running deep and swift, fortunately a kind sole (or ranger) had affixed a rope to a log that could be used for balance. After crossing the creek the bugs continued to harass constantly but not in the same numbers. The trail wraps around a small granite mountain which I initially confused with Ragged Peak leading me to believe we were quite close. We were resting on a log when a solo backpacker approached us. Brett had also come up here from the Bay Area and after a couple minutes of chatting he decided not only to let us borrow some of his bug spray but to let us keep the bottle. We were practically moved to tears. For the rest of the trip the mosquitos became only a mild irritation. After saying our goodbyes to Brett we continued along up the trail which continued a persistent but gentle climb up to the next creek. The trail ran through a dry forest with random patches of snow scattered throughout the pines. The forest broke as we approached the back side of Ragged Peak. A huge sub-alpine meadow filled the large basin around us opening up 360 degree views. Gentle granite slopes to our right dropped off to the left opening up a massive view across to the Cathedral Range deep in Yosemite. Their name becomes obvious looking at the spire like Cathedral Peak which demands attention. In the middle of the meadow a small creek presents a minor obstacle, at this high an elevation however not enough water has accumulated to make the creek deep enough to be dangerous. From this point on the trail feels like the high sierra. After the subalpine meadow the trail begins an arduous loop around Ragged Peak for roughly 3 miles. Ascending steeply up to the shoulder of the mountain, around 10,000ft and then dipping down in to the trees. Cathedral Range from the subalpine meadow. Beylah crossing a creek through the subalpine meadow. The trail follows the edge of the trees, with a thick forest to one side and a wide exposed granite slope to the other. 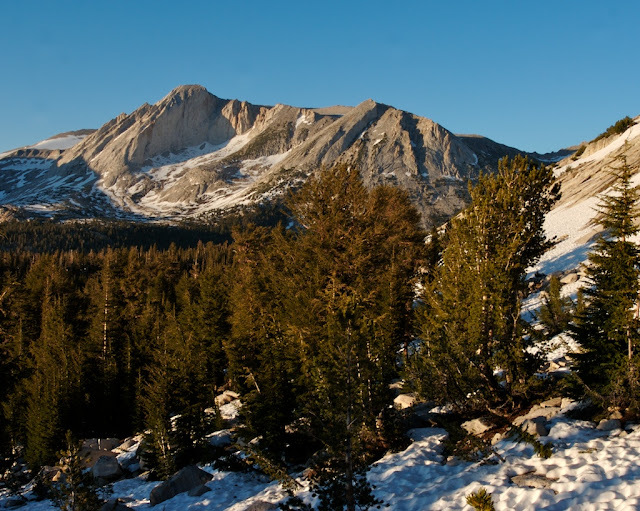 We saw a small group camping on the shoulder, no doubt to enjoy sunrise on the Cathedral Range. A few rock carins mark the trail as it becomes difficult to find in this area. Unfortunately one of these marks the wrong trail, and this is what we followed. Soon we found ourselves lost on the exposed granite slope of Ragged Peak. Fortunately from this location it was not hard to orienteer as we hiked along. I knew where the trail was generally but not exactly. Hand another hiker been using the trail it would have been easy to spot and probably only 200ft away from us. However we cautiously crossed the granite slabs, continuing up, and ahead. Beylah was feeling the altitude and our progress was very slow though. We started losing light as our route started to swing around Ragged Peak. Mt. Coneness emerged in the distance, and combined with a small rise off to our left side I was finally able to triangulate our position. We were about half a mile away from the trail but we could continue along a straight path down the slope of the mountain. Heavy snow and boulders made the descent difficult. I lead down the slope trying to teach Beylah effective snow travel as we continued down. Late afternoon light on Mt. Conness. I only actually became scared in the last few feet before we found the trail because I knew it was nearby, and I felt we should have come across it already. About 10 steps after the wave of panic came over me I saw a faint boot mark in the ground and there was the trail. We hugged and kissed, and became overwhelmed with emotion and relief. I'd never been truly lost before, least of all in the Sierra's. For about 15 steps though, I felt lost, and it is not a feeling I would like to repeat. The sun set about 5 minutes before we arrived at lower young lake. The photographic moment I had come to capture had passed just moments before our arrival. Only the faintest alpenglow lingered on the rocks above the lake when we set up camp. No rest for the weary though, we quickly pumped water from the lake, established our tent and set up sleeping pads. Dinner was a putrid curry rice backpacking meal that we had to choke down. After some hot coco we crawled into our sleeping bags and dozed off. Alpenglow on Ragged Peak from Lower Young Lake.